Flowers and their Seasons in Cyprus. The flower varieties below are an indication of what is available in Cyprus in the times shown, this is not hard and fast and is meant as a general guide only. 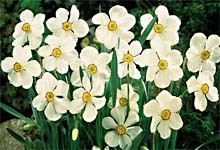 But these are the kinds of flowers you can expect to find in a bouquet from Cyprus flowers. Also find below some tips on how to get the best from your cut flowers in the hot weather in a climate such as Cyprus'. Please be aware that the general 'good condition' of cut flowers is by consensus from 2 to 4 days in the summer, whilst in the winter one may expect double that and with certain hardy flowers such as chrysanthemums and some strains of carnation, even longer. Do consider a pot plant or arrangement of plants in a basket as an alternative to cut flowers. They last longer. Anemone, Astromeria, Apple Blossom, Bachelor Button, Carnation, Cherry Blossom, Daffodil, Fern, Fresia, Iris, Ivy, Lilac, Lily of the Valley, Peony, Quince, Roses, Sweet Pea, Tulip, Violet. Aster, Astromeria, Bachelor Button, Bells of Ireland, Calla Lily, Carnation, Dahlia, Kaisy, Delphinium, Fern, Fuchsia, Geranium, Gladiola, Honeysuckle, Hydrangea, Ivy, Orange Blossom, Roses, Zinnia. **We are a VERY hot country in the summer. Flowers do not last very long unless kept in a fridge, which all florists do. Sometimes, depending on the journey to deliver them and whether the recipient has air conditioning, a bouquet may only last from 1 to 4 days, so we do recommend that you send a plant instead of cut flowers if the recipient may get upset at the complete waste of money. 1) Wash the vase each day and fill with fresh, clean water. 2) Cut a little from the stems at a 45 degree angle, with a sharp scalpel or scissors, preferably underwater. 3) Put a little drop of bleach or methyl bromide in the water. 4) Put a little sugar in the water. 5) Keep out of direct sunlight. 6) Put them in the fridge at night. 7) Do not allow any leaves to remain below water level. 8) Be nice to florists. These tips will keep any flowers you receive in Cyprus, even in the hot weather of July and August in the best condition that can be achieved.